So… again with the channeling Kate Greenaway thing, also a little bit of Peakswoods (a Korean ball jointed doll company), their fairies of fairytales were one of the inspirations for the Poppets series in general. I have noticed a tendency for ball jointed dolls to be dressed in totally over the top ruffled outfits (like this Little Red Ridinghood ensemble), so there’s a little of that here as well. I have a few dresses in process for the Poppets that take that concept on in a more fluffy way. 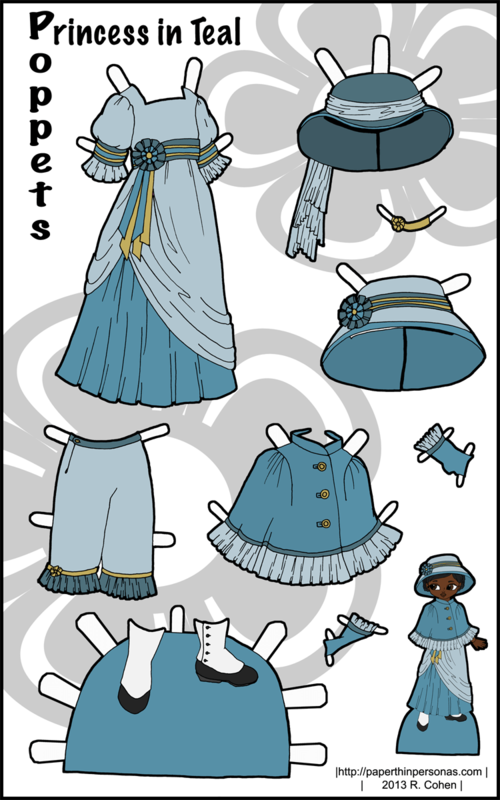 This set was drawn to go along with my second poppet paper doll Primrose. 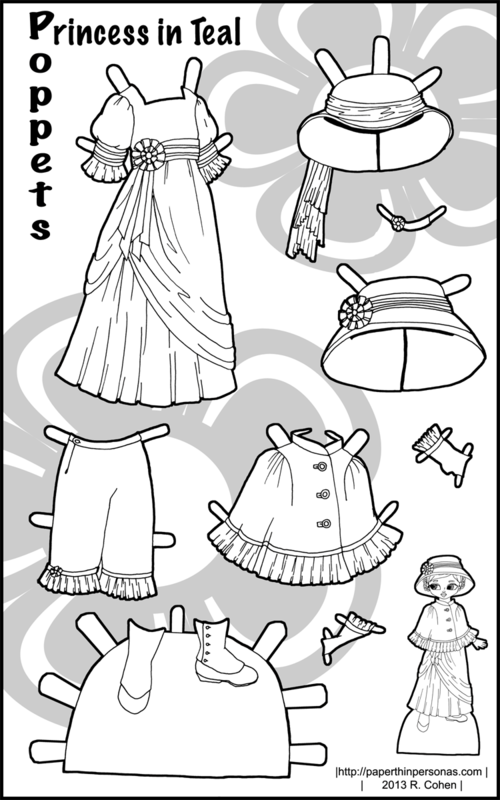 The dress, cape and hat, are all in the same color scheme and therefore can be mixed and matched. I am particularly fond of her little button up boots with spats on them. I realize now that I’ve mentioned Kate Greenaway twice and I probably should pause to say who she was. Greenaway was an artist whose work was published mostly between the 1870s and the 1890s. She drew idealic angelic looking children in pseudo-regency costumes. You can see scans of her work at the Digital Library of illuminated books. Last, but not least, I’d like to wish a very Merry Christmas to all my readers who celebrate it. I hope people have fun with family and friends today. I am with family myself and quite content. I’m having trouble accessing the pgn file and the black & white pdf.